The struggle for Black Americans is nothing new. Throughout history, some of us have chosen to take a role in the struggle, looking beyond ourselves and leading movements. There are hundreds of heroes that we have read about in history books, learned about in school, and have been highlighted in movies. There are thousands more who are the quiet heroes but whose stories are just as incredible, and their contributions just as significant. I think of Patricia Harris Roberts, the first Black woman to head a cabinet-level agency in the Federal government. As a young, Black professional woman working in D.C. in the 1950’s and 60’s, she experienced routine discrimination. But she rose to become the head of the Department of Housing and Urban Development in the Carter administration. She led a number of reforms that built greater economic opportunities in blighted neighborhoods and fought discrimination against women in mortgage lending. Or the story of Lucy Parsons, an American labor organizer and writer who co-founded The Alarm, the journal of the International Working People’s Association in 1883. Her powerful speeches on behalf of revolutionary socialism have influenced generations of labor activists. But no matter if the person is popular or less popular, they share one thing that is true in all our stories and movements: We cannot accomplish anything alone. This is exactly what we are experiencing in this moment. We are living in a different political reality. New threats have emerged challenging the security of our rights, our families and our communities. 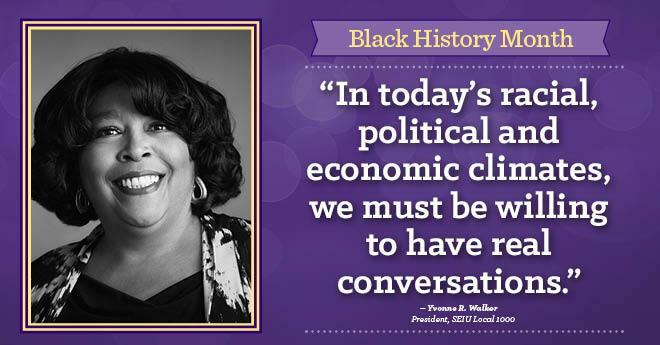 In today’s racial, political and economic climates, we must be willing to have real conversations. We must be open and honest with one another. There can be no confusion about who we are and what we stand for. The history of Black Americans and our struggle for justice and freedom has many examples and models for us to learn from. I look forward to sharing more of them with you in the month ahead.